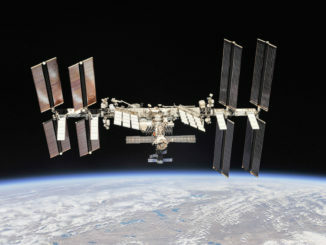 A three-man crew that departed the International Space Station on Oct. 4 flew their Soyuz spaceship into position to take spectacular photos of the orbiting research complex as officials prepare to celebrate the 20th anniversary of the first element’s launch. Russia’s Progress MS-09 cargo craft made a 3-hour, 40-minute trip from a launch pad in Kazakhstan to the International Space Station on Monday, setting a record for the quickest journey to the orbiting research laboratory. 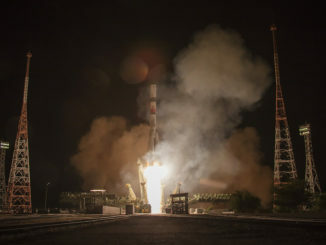 Look back on the mission’s predawn launch from the Baikonur Cosmodrome and radar-guided docking at the space station with these images and videos. 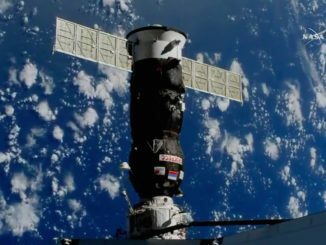 A Russian Progress resupply and refueling craft launched Monday from the Baikonur Cosmodrome in Kazakhstan, riding a Soyuz booster into orbit on a perfectly-timed departure that set the stage for an on-target docking with the International Space Station less than four hours later. 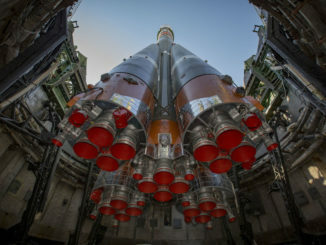 A Russian Soyuz rocket and Progress resupply freighter are set for liftoff Monday on an accelerated, less-than-four-hour rendezvous with the International Space Station after last-minute launch scrubs prevented two similar fast-track approach attempts in recent months.